Just been on a day trip to Portugal to fill in for profG who was due to present on the Current antibody treatments in MS.
As you can see there were 62 slides for a 30 minute slot. To do this would fray my mouth. Trying to present someone elses slides is not always easy. It is abit like looking at Japenese writing..
FYI…….I hope it means……”I do not understand”. …who knows? Google translate could be having a laugh! Anyway whilst trying to keep the frame work of the talk, I tried to address the aim ” Dissecting out the Mode of Action” and so had spent abit of time coming up with ideas….. I don’t make a habit of loading up my slides…..Why? Because they often contain unpublished ideas and data. This doesn’t concern ProfG so much as no one is going to scoop before you have time to publish as you are not going to do quick clinical trial. His co-authors have presented the data at upteem conferences …. Actually, this is not really true because I have realised there is loads of pharma-related stuff dumped in ECTRIMS and AAN abstracts that never see the light of day in a proper publication. In fact ProfGs slides reminded me of this fact as I worked out they relate to some unpublished study, but that’s another story. Anyway whilst trying to look at the action of MS drugs, I posed the question what cells drive MS? You can base this on the mechanism of action of the drugs in MS, but many will base it on what happens in EAE. But where is the evidence that disease is mediated by T cells? It is there perhaps interesting that we have this paper, talking about blocking interleukin 12 and giving a reason of why Ustekinumab failed in MS.
Cravens PD, Hussain RZ, Miller-Little WA, Ben LH, Segal BM, Herndon E, Stüve O.IL-12/IL-23p40 Is Highly Expressed in Secondary Lymphoid Organs and the CNS during All Stages of EAE, but Its Deletion Does Not Affect Disease Perpetuation. Interleukin (IL)-12 and IL-23 are heterodimers that share the p40 subunit, and both cytokines are critical in the differentiation of T helper (Th)1 and Th17 cells, respectively. Th1 and Th17 effector cells have been implicated in the pathogenesis of experimental autoimmune encephalitis (EAE), an animal model of the human central nervous system (CNS) autoimmune demyelinating disorder multiple sclerosis (MS). However, ustekinumab, a monoclonal antibody (mAb) against p40 failed to show efficacy over placebo in a phase II clinical trial in patients with MS. The role of p40 in initial T cell priming and maintenance in secondary lymphoid tissues is not yet well understood. Active EAE was induced in the B6.129-IL12b strain of p40eYFP reporter mice (yet40 mice), and Th1 and Th17 polarized cells were adoptively transferred into p40-deficient mice. Cellular subsets were phenotyped by multi-parameter flow cytometry, and p40 tissue expression was identified by confocal microscopy. We show that yet40 mice are susceptible to EAE, and that p40 is highly expressed in secondary lymphoid organs and the CNS during all stages of the disease. Interestingly, p40 expression in the recipient is not required for EAE induction after adoptive transfer of activated and differentiated encephalitogenic Th1 and Th17 cells into p40-deficient mice. Peripheral antagonism of T helper cell trophic factors critical for the differentiation and maintenance of Th1 and Th17 cells ameliorates EAE, indicating that p40 may play a critical role in the induction of CNS autoimmunity but not in its perpetuation. Our data may explain why ustekinumab did not ameliorate paraclinical and clinical disease in patients with MS. In patients with already established disease, activated antigen-specific encephalitogenic CD4+ T cells are likely already differentiated, and are not dependent on p40 for maintenance. A clinical trial of longer duration with anti-p40 mAbs or other forms of pharmacological p40 antagonism, or sequential anti-p40 therapy following T cell depletion may show a benefit by affecting de novo generation of autoimmune T cells. 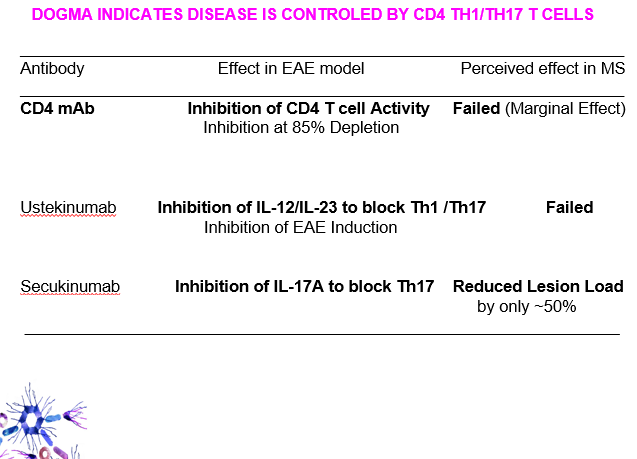 It says that Interleukin 12 was expressed in the CNS, but when you knock it out and transfer in myelin reactive cells that are Th1 or Th17 cells you get EAE, implying that IL12/IL23 is not important. Segal BM, Constantinescu CS, Raychaudhuri A, Kim L, Fidelus-Gort R, Kasper LH; UstekinumabMS Investigators.. Repeated subcutaneous injections of IL12/23 p40 neutralising antibody, ustekinumab, in patients with relapsing-remitting multiple sclerosis: a phase II, double-blind, placebo-controlled, randomised, dose-ranging study. Lancet Neurol. 2008 ;7(9):796-804. This was a trial done in nearly 250 people..must have cost a few million dollars. So on face value the evidence for CD4 control of MS is weak from a response to therapy point of view, as alternative arguments can be made for more MS drugs. I said the treatment worked in the induction of the intial phase of disease in mice, but the data showed that blockade with anti-IL-12/IL-23 did not block relapses…So not surprisingly it did not work in MS. So not so much that animal models are rubbish, but perhaps humans have either failed to assimilate this knowledge or ignored it. So the drug works very well during the induction phase and irradicates disease, with 0/12 getting sick. Do the same before a relapse and a whopping dose still does nothing with 17/21 getting sick which is the same as saline treatment. 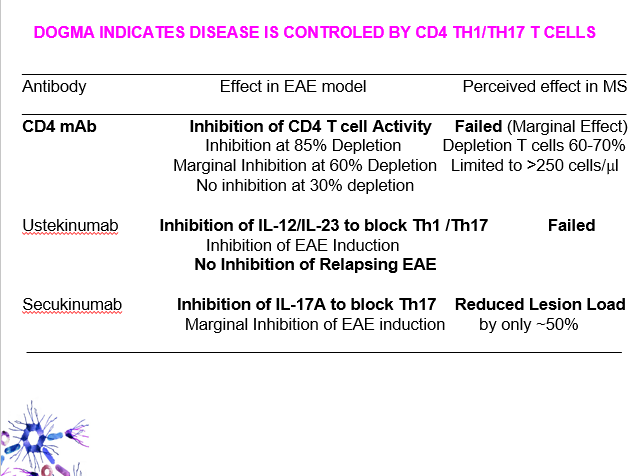 So while we are at it, lets explain more about the CD4 depletion in MS. The level of depletion was set a 250 cells/mm3 because below that AIDS was a occuring at ht time. 250 cells/mms is about a 65-70% depletion. Alemtuzuumab deletes CD4 T cells by 95% and after a year they are 70% depleted. In mice 85% depletion blocks EAE, 30% depletion had no effect and about 60% depletion had minial effect in an optimised EAE model. So maybe they did not deplete enough. We will never know the answer because no one is going to do an anti-CD4 trial again. 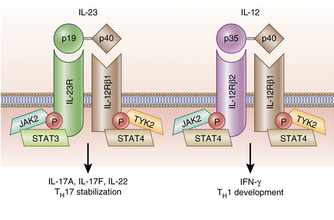 Next the IL-17 inhibition. In mice the effect of blockage of IL-17 when you take a step back and look at the data is they there is a small inhibition and delay in the intial phase of disease. So not much good. So is the human data really that much different? But what will the likes of the RSPCA think about the Ethical Review commitee processes. It looks like the Heremans paper was not cited in the study above was it not seen or just ignored by the authors and the referees. There has been a load of animal studies whicu ultimately is not very 3Rs. Maybe we need 4Rs. Refinement, replacement, reduction and reading. In some parts of Continental Europe each experiment has to get ethical approval, in the UK the situation different in the project gets the approval. In the UK the process is already so long-winded that pharma gave up the ghost and moved their animal work abroad. Likewise getting ethics to do human work in the UK has become similarly slow and a painful experience. This makes us slow to react when it takes months to follow up on an idea.